As the women’s race kicked off today, the anticipated sprint to the finish ended with Team TIBCO-Silicon Valley Bank delivering their 2015 National Champion (Criterium) Kendall Ryan, (born Thousand Oaks, Calif. / resides Ventura, Calif.) to the stage victory. Next over the line were Rally Cycling’s Emma White (Duanesburg, New York) and Wiggle High5’s former track World Champion and 2012 Olympic Omnium Bronze Medalist Annette Edmondson (AUS). The opening stage for the women’s race returns to Elk Grove, which made its first race appearance last year, for an 80-mile day with two Sprints and no Queen of the Mountain climbs (QOMs) – a very fast and flat route that delivered the expected bunch sprint to the finish. Just over halfway into Stage 1 presented by Visit California, a breakaway including BePink’s Lisa Morzenti (ITA) and Hagens Berman | Supermint Pro Cycling’s Whitney Allison (Fort Collins, Colo.). Allison spent solo time off the front to earn the Breakaway from Heart DiseaseTM Most Courageous Rider Jersey before being reabsorbed by the peloton as they began arranging to deliver their sprinters to the finish with about 6 miles left to ride. Presented by Visit California, tomorrow’s Stage 6 (M) and Stage 2 (W) both include the HC climb up Kingsbury Grade. The women will spend the day on a 67.1-mile climb-centric day in South Lake Tahoe, where the men will also finish after a 122.1 mile trek including seven categorized climbs that they’ll begin to encounter shortly after they depart from Folsom. 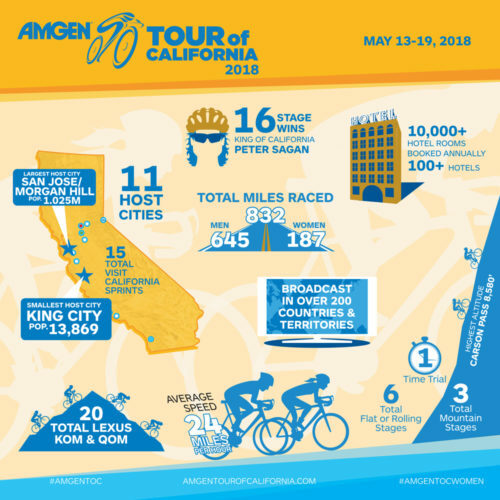 The 2018 edition of America’s premier cycling stage race covers 645 miles of roadways, highways and coastlines during seven stages from Long Beach to Sacramento May 13-19, while the Amgen Tour of California Women's Race empowered with SRAM, showcasing the world’s best women cyclists, runs concurrently May 17-19, covering upward of 187 miles over three stages. The annual professional cycling events are the only U.S. races on the UCI WorldTour calendar and continue to attract some of the most renowned cyclists and teams in the world. Tour of California 2018 infographic.